Long Beach Rotary recently raised $45,000 for its Reading by 9 literacy efforts, an all-time record for the service club, which has raised more than $470,000 for literacy programs over the past 16 years. By the end of the school year, Rotary will have donated more than 215,000 books to local children, school libraries and non-profit literacy programs in the Long Beach area. The goal is to increase the percentage of students reading at grade level by age nine. About $30,000 of this year’s funds were raised in just a few minutes at a recent Rotary meeting, with the remainder coming from matching funds from the Rotary Charitable Foundation and private foundations. Reading by 9 provides books and other support to local preschool and K-3 students, schools, libraries and literacy programs. This year’s programs include the club’s traditional Scholastic book grants of $2,000 to seven Long Beach Unified School District elementary schools, resulting in nearly 1,000 books going to each school. Over the years, Rotary has awarded at least two grants to every LBUSD elementary school. The funds also will provide: $2,000 each to three LBUSD elementary schools to purchase award winning “Best of Series” books for their libraries; $7,000 for the purchase of Scholastic books for LBUSD’s Child Development Center preschool programs (including giving a book to each of the CDC’s approximately 2,000 children; electronic books for the e-book pilot program initiated with four elementary schools two years ago; up to $5,000 in grants to local nonprofit literacy or book programs; books for all children attending the four Kindergarten Festivals offered by LBUSD; books for children at Rotary Centennial Park programs and other Rotary projects; and $6,500 in Teacher Literacy Grants to be awarded to creative and innovative classroom literacy projects initiated by K-3 teachers. “The Teacher Literacy Grants were a big success last year, and we are increasing the total funding from $5,000 to at least $6,500 this year,” said Rotarian Frank Newell, a local attorney and Poly High School alum who has supported Reading by 9 for many years. Applications for the teacher grants will be available in the coming weeks. 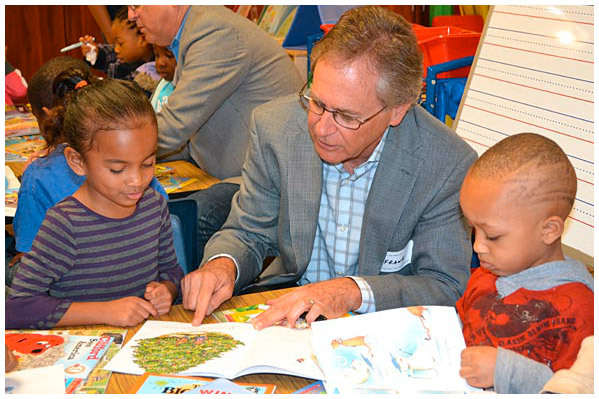 EARLY LITERACY – Rotarian and Long Beach Poly High School alum Frank Newell reads with preschoolers at the Central Child Development Center. Rotary raised a record $45,000 for early literacy programs this year, surpassing $470,000 over the past 16 years. The effort has grown in recent years, providing e-books and grants.